Thousands of widows will not receive full compensation for their husbands' deaths from asbestos-related cancer, Law Lords have ruled. There will be a compensation limit in cases involving several employers, none of whom can be specifically blamed for the onset of the fatal illness. Insurers had challenged a judgement favouring bereaved families and workers who contracted mesothelioma at work. Their successful appeal may affect claims worth millions of pounds. Employers' compensation liability will be drastically reduced in many cases. Tom Jones, a partner at Thompsons solicitors, which is representing the widows, told BBC News: "Their husbands are dead, their husbands were negligently exposed to asbestos. "Nobody knows who gave them the fatal fibre but the fact is, one of the employers did, and why should they not get full compensation for the negligence potentially of one of those employers? "They don't know who it was - nobody knows who it was but surely it must be right they get their full compensation when they have died because of no fault of their own." Mr Jones said the next move would be for the widows' legal representatives to attempt to gain trade union backing for proposed legislation to cover the problem. He added that they would seek the addition of a clause in a compensation bill currently going through Parliament to say those exposed to asbestos should be paid full compensation by a past employer. A group of widows and supporters are planning a demonstration outside Parliament on Wednesday. Mesothelioma is a form of cancer that attacks the lining of the lungs - and the only known cause in the UK is exposure to asbestos. In the appeal, insurers sought to limit an employer's liability to pay damages in cases where a worker may have been employed by several firms, none of whom can be specifically blamed for the onset of the fatal illness. They argued that an employer's liability should be a proportion of the total compensation, to reflect the extent to which it contributed to an employee's exposure to asbestos. Following the ruling, Nick Starling, of the Association of British Insurers, said: "This is a very detailed and complex judgement, and the industry will study it carefully to examine the implications for claimants and insurers. "Our overriding commitment is to ensure that claimants receive the compensation to which they are entitled." But Richard Langton, president of the Association of Personal Injury Lawyers, said the ruling was "an insult" to thousands of claimants and their families. In 2002 Law Lords ruled that an employer who negligently exposed a worker to asbestos could be held 100% liable - even if the employee had worked for several companies and it could not be proved which of them had caused the illness. 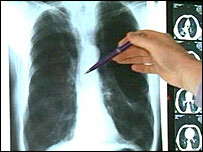 About 1,900 people die in the UK each year from mesothelioma. The appeal raised the question of whether compensation should be denied altogether when a mesothelioma sufferer was in contact with asbestos during a period of self-employment, even if they were also exposed to asbestos in a different period as an employee. The test case of Sylvia Barker, 58, of Holywell, Flintshire, was at the centre of the dispute. The widow was awarded £152,000 in the High Court three years ago for the death of her husband, Vernon, who died aged 57, in 1996. Mr Barker had worked for John Summers and Sons at the Shotton steelworks on Deeside. He had been exposed to asbestos while he was employed there as well as for another company and for short periods during 20 years of self-employment. Her damages will now be reassessed by the High Court to reflect the proportion of blame attributable to his time with Summers rather than 100% liability for his illness and death. The Lords' 4-1 majority judgement also covered two other appeals. The case of John Murray, who was employed by British Shipbuilders (Hydrodynamics) for 52 years, was considered, as was that of John Patterson, who died in May 2002 having worked with asbestos for much of his working life until his retirement in 1974. In both cases insurers argued that, on a "time exposed" basis, they should pay only a proportion of the damages. The awards in both cases will now go back to county courts for reassessment. Mr Murray's widow said justice had not been done. In a statement, she said: "Employers and insurance companies care more about the money than they do being fair to people like me and my husband who suffered so much."